Financial proficiency has never been more critical to the success of your business, or to the development of your own career. 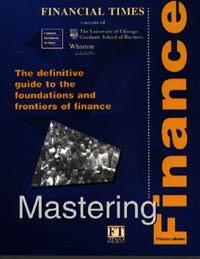 FT Mastering Finance is an indispensable guide for anyone who is serious about understanding and applying the latest principles, practices and roles of finance. From capital structure to caps and floors, from random walk to risk management, this book covers the key areas of corporate finance, financial markets and investment management. It delivers an unrivalled combination of new thinking and practical wisdom, direct from the cutting-edge of financial innovation. For managers, corporate finance professionals and investment managers alike, FT Mastering Finance provides a perfect introduction to the foundations and frontiers of finance, bringing together the latest in financial expertise from the world's top three finance schools. The combination of faculties from the London Business School, the University of Chicago Graduate School of Business and the Wharton School of the University of Pennsylvania is unbeatable in the field of finance. A world-class companion to the changing world of finance, and the launch-pad for any finance course, FT Mastering Finance is your best possible investment for a profitable future. Note: This book can be ordered from the Global-Investor on-line bookshop. The order is made directly with them and The Eagle Traders Group is not responsible for the delivery of the book. The information on this page is presented to you as a service only.